Dysart certainly did not set out to spot Tucson Sahuaro 15 points in Friday’s 4A Conference play-in game even though it looked away. The visiting Cougars cut the Demons defense to ribbons and confused their young foes with a full-court press that morphed into a 2-3 zone in the half court. Keegan Cook called two time outs in the first seven minutes and his team trailed 15-0, then 17-2 after a quarter. “Sahuaro definitely came to play and our guys, with their inexperience, took a while to get into the flow of the game. I think they were a little shell-shocked at how hard Sahuaro was playing and how fundamentally sound they were,” Cook said. But Cook’s team dusted itself off and began to dig out of its chasm. They were within eight points (33-25) at halftime. After three quarters, the deficit was three (40-37). The Demons earned their first tie with 3:10 remaining, and took its first lead with 1:26 left. No. 19 Sahuaro (15-11, 11-7 regular season) battled back to force overtime, but No. 14 Dysart (20-6, 14-4) hit four free throws and held on for a 55-54 win. The gigantic comeback vaults the Demons to their third straight 4A first round berth. This time the program got there starting a freshman, three sophomores and a senior. No one ranked above Dysart lost Friday, so the team will enter the main draw seeded No. 14. Buckeye (20-6, 17-1) is the most likely No. 3 seed and opponent. Wherever the Demons play Tuesday night, they are likely to be playing with house money. “Any of those eight teams we match up with is going to be really tough. They’re great teams. But we can play free and hopefully knock down some shots and see where it goes,” Cook said. It all seemed very unlikely Friday as the Tucson team was embarrassing Dysart to start. Senior point guard Kevin Poe had five of the Cougars’ first nine points to force a time out. Junior shooting guard Kyle Hubbuch tacked on a pair of three-point shots. He scored all 12 of his points in the first half – on four treys – to lead all scorers at the break. 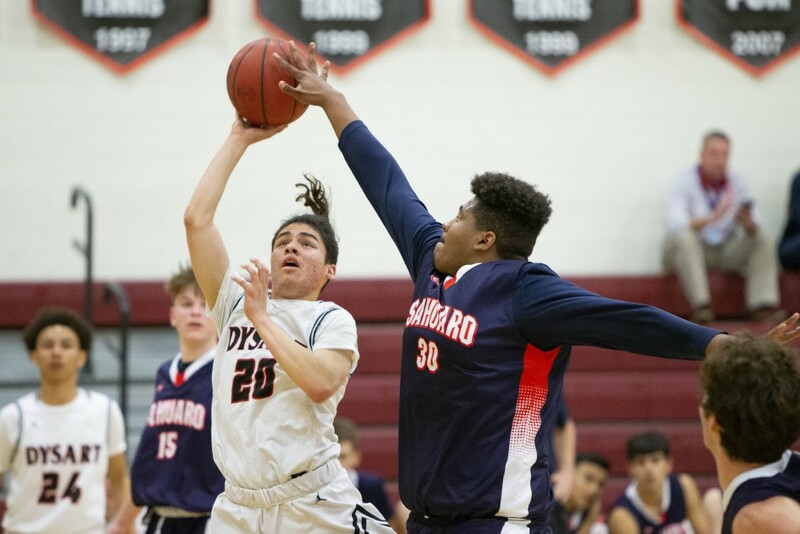 Dysart began to dig out of its hole thanks to the efforts of sophomores Dariyan Matthews and Santos Sanchez. Sanchez started things with a steal and his team’s first three points, then the guard grabbed an offensive rebound and dished to Matthews for a three-point play. “Santos has always been one of our greater defenders, and seeing the energy he brings on defense helps the offense as well. When he got some points, it inspired us,” Matthews said. The forward had his team’s next seven points, and finished the first half with 11 points and nine boards. Ten of Matthews’ eye-popping game total of 19 rebounds came at the offensive end. Sahuaro senior forward Shea Heslep blocked five Demon drives, and adjusted several other shots but that also left Matthews in the clear for a bevy of weakside boards. “A lot of (offensive rebounding) is will. And #50 (Heslep) is a great shot blocker. We were told that going into the game. You just have to have the will to say, ‘OK, he might block my shot sometimes. But sometimes he won’t.’ You’ve got to keep going up there. Especially when Riley or Nate would drive and he’d leave me open for the rebound or the dish – you’ve just got to go back up with it because it’s the best option,” Matthews said. Still, the home team trailed 23-8 early in the second quarter. Fornerette was the third Demon on the board, and his initial triple cut the deficit to 23-13. With 2:06 left in the half, he hit another pull-up trey and gained momentum for a big second half. His shot made in 28-22. “The three gave me a whole bunch of confidence. Coach tells me to keep shooting, keep working,” Fornerette said. All things considered, the coaches were thrilled to trail only 33-25 at the break. Sahuaro junior forward Zach Bates immediately hit the first five points of the third quarter. Dysart freshman and leading scorer Nathaniel Pickens stopped the bleeding with his first bucket, but picked up his fourth foul shortly thereafter. Bulky senior forward Michael Camacho contributed off the bench, hitting a free throw and a corner three to slice the deficit to 40-36. With Pickens still on the bench, the Demons’ other dynamic young guard took early in the fourth quarter. Fornerette’s five-point stretch dragged Dysart within one (43-42). Poe responded with two aggressive drives and hit all four free throws. Camacho drained another triple. Then Fornerette double clutched and somehow tossed in an acrobatic layup over a pair of Cougars to tie. Bates, who led the Cougars with 17 points and eight rebounds, restored their lead. Pickens picked an excellent time for his second basket, a three that gave Dysart its first lead (50-49) with 1:26 on the clock. Poe scored his 16th and final points of the night at the 49-second mark. Matthews was fouled following another offensive rebound with 37.4 remaining and hit one free throw to tie it at 51. He then blocked Sahuaro’s last two layup attempts to force overtime. Fornerette tweaked his ankle early in overtime but returned. Senior guard Kobe Ganados came up clutch with a pair of offensive rebounds, then drew a foul and hit both attempts for 53-51. The Fornerette sank a pair to stretch the lead to 55-51 and cap his 18-point night. Poe then made one of two and the Cougars forced a turnover, but Bates’ layup dropped with three seconds left and the visitors could not stop the clock from running out. “I knew it wasn’t that bad. I’ve had experience breaking my ankle. I could still play and fight for my team,” Fornerette said. Though it is easy to focus on the Demons’ bright future, Cook was thrilled that seniors Camacho and Ganados contributed some crucial plays down the stretch. “It was awesome to see Michael hit a couple of big shots for us. Kobe made a couple of big free throws. And both of them are leaders. They were here last year in the playoffs. They knew what to expect in playoff basketball. Some of my younger guys are still trying to figure it out,” Cook said.